This being my second time to visit and stay at this backcountry hut, I was confident to lead this as a chapter ski tour. Located at 9,200 feet elevation in Kings Canyon-Sequoia National Park, the hut is in a glorious setting. My first time, an exploratory trip with a beginner skier, brought us into a 1979 New Year's Eve blizzard. We assisted in rescuing a lost group--finding them, and then getting them to the hut. A Navy chopper was to carry them out, we heard later. 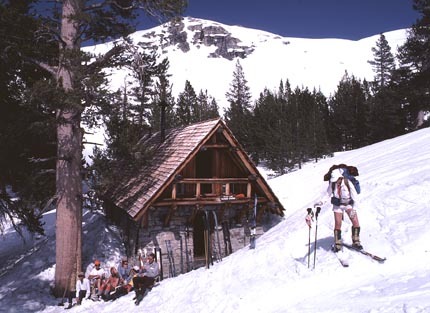 This is the most memorable of the Sierra backcountry ski huts. I have been here now some three times on skis, twice in deep winter. The reservations are made by drawing lots, and most ski groups will try to secure a weekend. Despite the longer drive from the big cities, it is well worth it. Our joint SMS trip begins in Giant Forest. We had a pleasant breakfast in the cafeteria, enjoying the huge Sequoia trees all about. Driving our vehicles to the parking lot at Wolverton Ski Area, we were busy getting ready for a two night stay at the Hut. Ski gear lay strewn about as our group of ten or so prepared for the long climb and tour to our destination. All three of our northern group were on three-pins, while many of the others skied with heavier gear. Some treatment and skins needed to be applied to the heavier skis. Finally getting started, we followed the markers on the trees. These lead almost to the Hut. The climb is made through forest, going this way and that way. After about 2,000 vertical feet of climbing, we came to the first ridge. The view to the east was starting to get dramatic. We skied down a short drop, some with skins still on, to Heather Lake. Most of the elevation gain is done at this point. We enjoyed the high snowy beauty, then we came to Aster Lake. An incredible sight greeted us--the high crags of the ridge to the south. I posed for a picture with my own camera. The clouds drifted over these crags, which are reminiscent of the European Alps. Further along, a potential avalanche slope must be crossed, then a big hill is climbed or traversed around. When this is done, one comes to the sight of the Hut below. This makes for one final, short, ski descent, if the hill is climbed. We arrived at about 2 p.m., and lawn chairs were promptly employed (photo above). There was still plenty of daylight, which shouted at us to get in a few downhill runs. A big hill to the south was climbed, and the clouds drifting by led me to think I was in Ski Heaven! Lingering for a moment, we began the first of excellent spring ski conditions running down back to the Hut. We were skiing in the clouds. The hut oil stove was fired up, and we had our meals. We were in shirts around the table. There are bunks for sleeping, and some had brought up fine wine. A few lanterns illuminated the interior, with books and magazines for our perusal. Our next day's tour took us to the summit of Winter Alta Peak (11,200+'). While the actual Alta Peak (11,204'), which has a trail for summer use, is a separate summit, the peak that we climbed was more suited for skiers. A big avalanche was seen across the big canyon to the south. A huge slab had broken off in two pieces. With most leaving their day packs, the group made S's down the south-facing slopes. I took my camera pack, and had a difficult time with the lighting. I couldn't see what I was skiing. I went slow, taking falls, but came down to the group waiting 2,000 vertical feet below. We climbed back up the hill, and some toured to the east. A high plateau called the Tablelands made for a fine easy gradient. 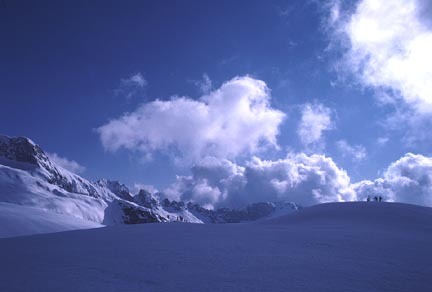 The Tablelands are used for skiers making a crossing of the High Sierra, using what is known as the Sierra High Route. 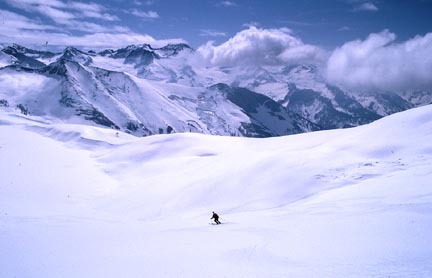 A ski trail in the Alps is known there as the Haute Route. The idea behind these is similar. A route that stays along a high crest, with fantastic views and alpine sights, is established in many places where ski touring is king. There is even a high route along the north rim of Lake Tahoe. I skied back to the Hut, and we enjoyed another, more comfortable, stay. It doesn't take long to get used to this! Plenty of drink and food was available for all. The next, and last, day of our stay saw the group crossing a high ridge to the southeast, then skiing down to Moose Lake. Weather began to develop, so we hurried back to the Hut. We prepared to ski down the route back to the cars, all with 40 or so pound packs. We skied past the lakes, then came to the continuous downhill through the trees. Visibility lowered. The leader took us through the "rock garden," which is a humped area with moguls formed naturally by large boulders. This was fun! We stayed pretty much together, except when some skiers had trouble with their special bindings. Back to the cars in due time, we knew we had done it again, expediently and safely. We had plenty of time to make the easy drive home. Another elite group of skiers considers three-pin skiing the wrong way to do it. With special bindings, mostly European in manufacture, the conditional release design offers a safety feature that the three pin set-up, then, doesn't have. With some bindings, if your ski goes around, your foot goes with it. Therefore, you keep your speed under control and don't take bad falls. The special bindings release the ski from your feet if certain directions of pressure get too strong. No binding works perfectly, which is why skiing, especially for beginners, is an injury prone sport. Broken ankles and legs can result. Even amputations may have to then be performed. So, as they say, don't try this at home, or, if you don't have the skill and experience. View the slides, and enjoy from your computer!